Jules Olitski was born in Snovsk, Russia (now Shchors, Ukraine) on March 27, 1922. His father, Jevel Demikovsky, had been politically executed just before he was born. He was brought to the United States the following year by his mother and grandmother. His mother remarried three years later. He showed an early love for drawing and attended art classes on Saturday morning in New York. 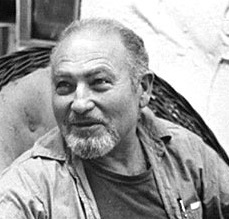 He studied portraiture at the National Academy of Design in New York City under Sidney Dickinson during the 1940s, then traveled to Paris where from 1949 through 1951 he studied at the Academie Grande Chaumiere and with Ossip Zadkine, the sculptor. His work was growing steadily more abstract. In the late 1950s he began incorporating heavy impastos and murky color in his painting and in 1960 his esthetic took an abrupt turn when, in his search for more original effects, he began dyeing large canvases. He produced a large body of work in pure color but the art world was very slow to accept it and he lived from hand to mouth for a long time. When success did come, he and his wife Kristina began living a very different life. During the winter months they live in the Florida Keys, on an island facing Florida Bay. In the spring they move north to Bear Island, New Hampshire. They also own a townhouse in the East Village of New York City. Kristina works right along with him, helping to mix colors and contributing to the Color Field path his work has taken him.